High School of Fashion Industries students in their new Nine West frames. RANCHO CORDOVA, Calif., June 25, 2018 /3BL Media/– A charitable collaboration, first developed through Hurricane Harvey outreach, is now taking formal shape in a year-long effort to provide access to comprehensive eye exams, prescription glasses, beauty and fashion items where they are needed most. VSP Global, which includes the nation’s largest not-for-profit vision benefits company, and GLAM4GOOD, the award-winning empowerment platform and non-profit organization, announced today that they are joining forces to make a greater impact in the communities they serve. After Hurricane Harvey, VSP Global joined GLAM4GOOD in Houston, Texas to help 750 teachers and educators who had lost everything. GLAM4GOOD organized a “shopping spree for free,” and local VSP network doctors, all of whom had practices damaged or destroyed by the hurricane, volunteered to provide no-cost eye exams with prescription glasses made onsite with the VSP Global Eyes of Hope mobile eye care clinic. This year, the two organizations partnered again in San Juan, Puerto Rico, eight months after Hurricane Maria devastated the island. San Jorge Children’s Hospital patient floors were transformed into eye exam rooms and mini-boutiques filled with clothing, accessories, toys and designer eyewear for pediatric patients and their families. Additional initiatives where VSP Global and GLAM4GOOD are partnering include a recent outreach event in New York City. A total of 150 seniors at the High School of Fashion Industries had the opportunity to shop for workwear and receive eye exams from local VSP network doctors who volunteered their services. 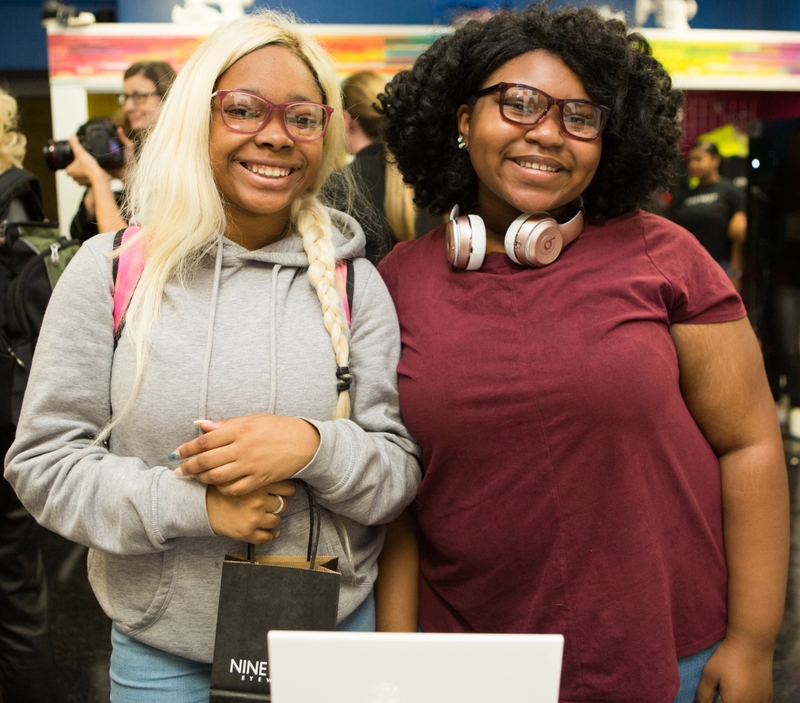 The students also received glasses from Marchon Eyewear’s new Nine West optical line for teens, helping set them up for success as they journey into the world of style. This fall, the two organizations, alongside the New York City Administration for Children's Services (ACS), will host an adoption day celebration in recognition of those who help make adoption a reality. For more information about VSP Global Eyes of Hope charitable programs visit globaleyesofhope.com. VSP Global® is a doctor-governed company that exists to create value for members and opportunities for VSP network doctors. Our industry leading businesses include VSP® Vision Care, the only national not-for-profit vision benefits company, which provides access to eye care for 88 million members through a network of 39,000 doctors worldwide; Marchon® Eyewear, Inc., one of the world’s largest designers, manufacturers and distributors of high quality eyewear and sunwear; VSP Optics, industry leaders in ophthalmic technology and lab services, providing custom lens solutions for the vision and lifestyle needs of patients; Eyefinity®, the industry leader in practice management and electronic health record software, and VSP Retail, which focuses on increasing access to eye care and eyewear through multiple channels. Together with VSP network doctors, VSP Global Eyes of Hope® has provided access to no-cost eye care and eyewear for more than 1.8 million people in need. The GLAM4GOOD Foundation is a non-profit organization that creates and celebrates social impact, and empowerment through beauty and style. The GLAM4GOOD Foundation harnesses the healing power, joy, and attention that fashion and beauty bring to raise awareness, bolster self-esteem, promote healing, honor courage and provide life-changing makeovers, clothing giveaways and confidence-bolstering fashion and beauty initiatives for everyday heroes and people in need. GLAM4GOOD is proud to be the fashion and beauty industry’s go-to partner for corporate social responsibility and philanthropic initiatives. If you wish to support this initiative or contribute to future GLAM4GOOD giving events, please contact info@glam4good.com.